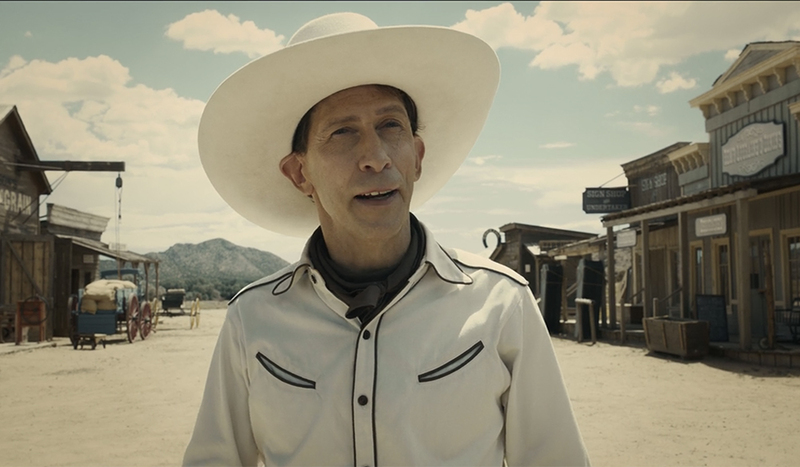 The Production Design Challenges of "The Ballad of Buster Scruggs"
the Coen Brothers’ new Netflix western anthology presents the struggles of living out West in six short, provocative vignettes. It’s one of their most ambitious projects to date — playing with the medium by telling six stories that play on a theme that the Coen Brothers are very familiar with: death. From Fargo to Burn After Reading, the Coen Brothers’ films remind us that no matter who you are, or how important you are to the story, you’ve got a pretty good chance of dying. Since westerns are such a unique form, they require a very acute sense of detail to really immerse the viewer. Pulling it off takes a load of planning — and a very thorough production designer. Jess Gonchor has worked on quite a few of the Coen Brother’s films, and he approaches his job as an art form. No Film School recently spoke with him about his work on Buster Scruggs and his experience working with the most prolific directing duo in the industry today. I think the main thing about them is that they’re so confident and they believe in their idea so much that they don’t really drift too far from that. They like to stick to the original plan, which to me is probably always the best. If you’re going to shoot a western and you have a specific thing in mind, yes, it could change a little bit, but you know it’s a western. You know it’s in a town. You know there’s ten buildings. You know somebody’s going to walk out of the bar, somebody’s going to get shot. They don’t all of a sudden try to make it into something else after we’re far down the line. I think that’s what makes them really unique. They were definitely the same time period, sort of post-westerns. It’s an interesting question. Now that you mention it, there are a couple of similarities, really only with the last story, “The Mortal Remains,” which is more Victorian-era. But I think “The Mortal Remains” is much more of a startling, theatrical, almost one-dimensional type of story, more than TrueGrit was. 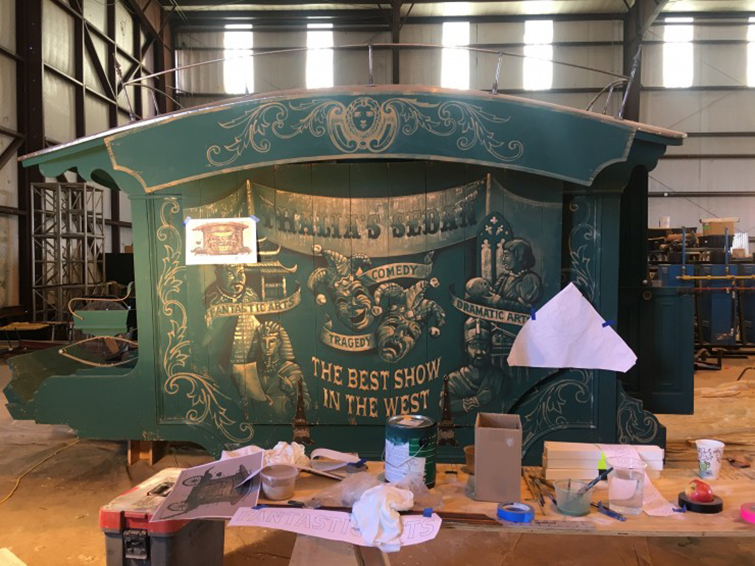 The model set design of Buster Scruggs. Designing six different sets for one film is a monumental task. So what’s the best way to consolidate all of your ideas? Usually, Gonchor uses a series of giant bulletin boards that organize his sketches and mock-ups, but for a set design as detailed as a western town, he had to go 3D. 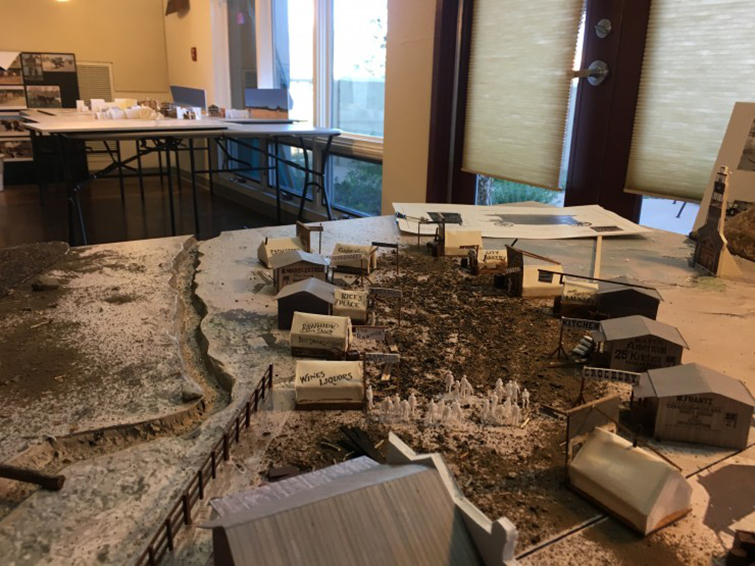 This included using 3D modeling, building foam core models, and even designing entire miniature sets to get a 360° view of the set before they set out to build the full-sized one. We really stuck to an older style of filmmaking on this one. A lot of this was like playing with green army men and getting down at their height. Even using my iPhone with a lens, because you can get the Panavision lenses on your phone now. You could just look at everything in miniature. We got our hands dirty. It wasn’t like reading the newspaper, The New York Times, online. It was like having the Sunday Times and every section on your kitchen table, touching it and feeling it and going through it. There’s the “Meal Ticket” story. I don’t know of anything else out there that exists like that. He’s standing up in the town at night and doing a show. I’m like, what is this thing going to be? What’s going to hold this guy up? Do they live in there all time? Do they sleep in boarding houses? I mean, that was like a whole “What the hell? What is this?” I’ve never seen anything like it, exactly. The feeling and the vibe of that film would be McCabe and Mrs. Miller, because it’s a moist, damp, wet, high altitude, snowy, dark sort of film. The show wagon itself, though, is it a medicine car? 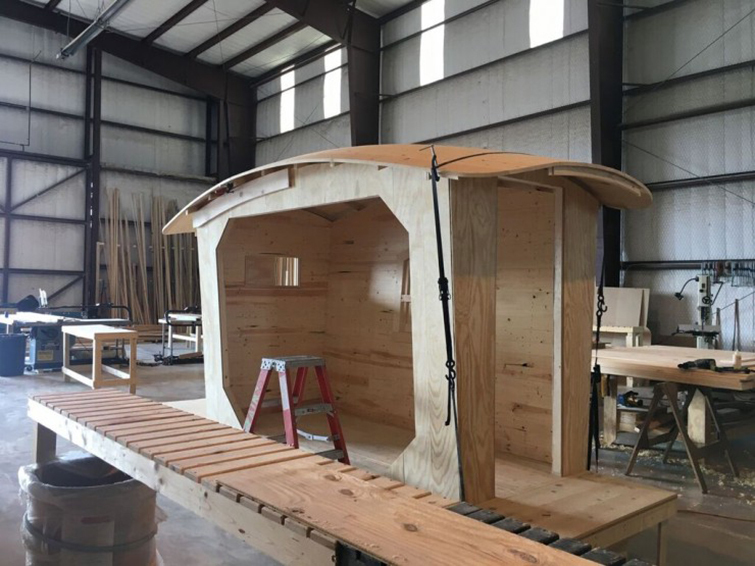 Is it a gypsy wagon? It’s not like any of the other things we had in there, the calistogas or the stage coaches. It was just some unique thing that I had never seen before. I looked a little bit at the old circus freaks movie, Freaks. They had a couple of weird contraptions the carnies rode around in. As you can see, the design of the set can influence the look and feel of the entire film, and it’s hard to compete with Jess Gonchor’s ability to do so for the Coen Brothers. 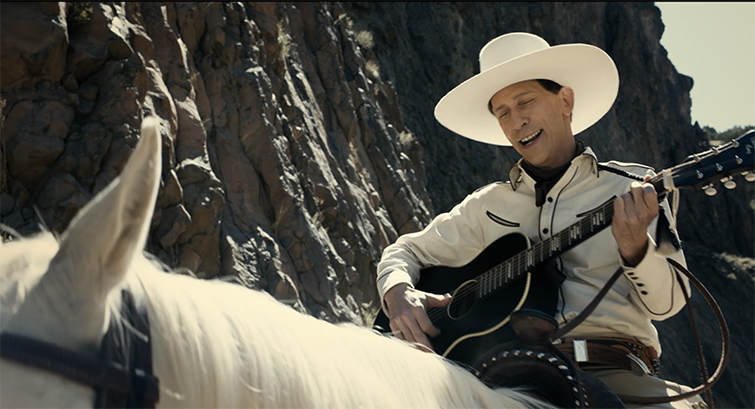 You can see his latest work come to life in The Ballad of Buster Scruggs, currently on Netflix. For the entire interview, check out the full article at No Film School. 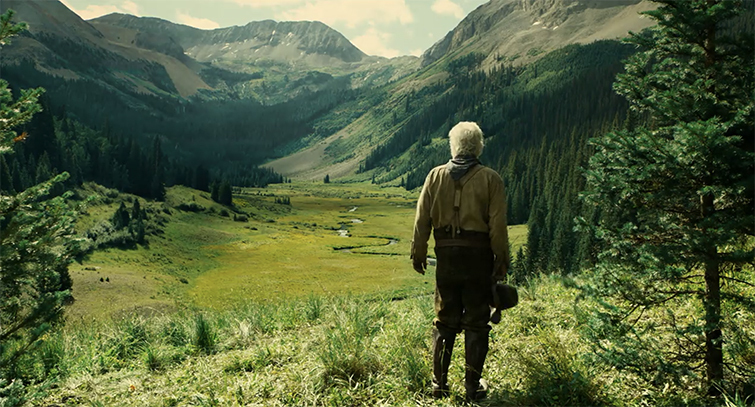 All images via The Ballad of Buster Scruggs(Netflix). Looking for more articles on production design? Check these out.